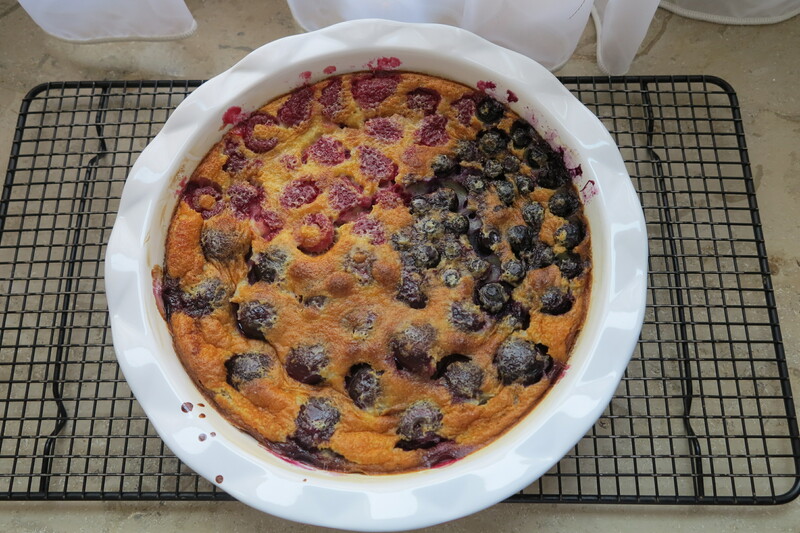 Considering how often I’ve eaten this week’s French Fridays with Dorie recipe, Cherry Clafoutis, it’s rather a wonder that I’ve never made it before myself. This dessert was quite the hit in my family some years ago and was made quite often during cherry season. Though, as I recall, the recipe was a bit more involved and included a hit of cherry liqueur. Dorie’s recipe is the height of simplicity. You don’t even have to pit the cherries. Just throw them in a baking dish and drown them in a quick mix of cream, milk, eggs, vanilla, and sugar, and into the oven it goes. Dorie suggested that other berries could be used and so I decided to do half cherry, one quarter raspberry and one quarter blueberry to see what we liked best. A word on the whole cherry idea before I go on. When I mentioned this to my parents I was met with a resounding NO! The concept was apparently way too bizarre to contemplate. And I have to agree that it sounded odd to me at first as well. But if you think about it, why is this so very different from sitting and eating a bowl of fresh cherries? I certainly don’t take the time to remove the pit from fresh cherries before I eat them and this was pretty much the same procedure. I think it’s more of a mental thing because fresh cherries are typically eaten in a casual atmosphere whereas a fancy french dessert surely deserves more refinement. But hey, if the creators of the dish (namely the French) are not too proud to deal with the pits, who am I to put on airs? So, whole cherries it was, and they were delicious! I really enjoyed this dessert and I especially liked how easy it was to prepare. My husband and I both liked the addition of cherries and blueberries, but were not convinced by the raspberries. They seemed to let out more water into the custard and may have been the reason why my dessert needed an hour in the oven before it was cooked through. All in all, a winning dessert. I like your berry cherry medley! Have a nice weekend, Rose! Your triple berries are beautiful! 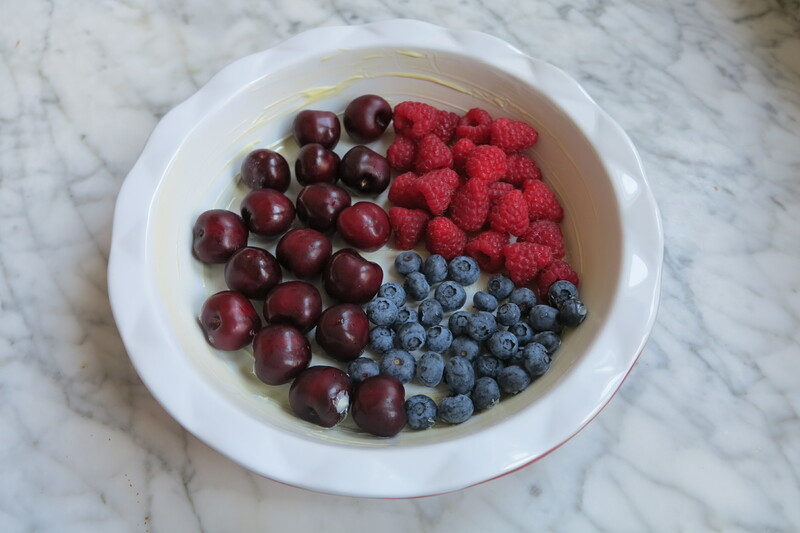 I do like the combination of berries – yum! Mine took an hour to cook too – I used frozen cherries. You brave soul with your whole cherries… I was too worried about cracking a tooth. I like the idea of bit of liquor. I think Cher had a recipe with kirsch. Love the idea of triple berries…quite lovely! I have to say I pitted my cherries…I worried about serving this to my friends and someone choking! The liquor was definitely a great addition. Have a great weekend, Rose! I found that my cherries gave off a fair amount of liquid too. actually just around where the cherries sat, was still pretty moist, but we just went with it since the rest of the custard had set and it was pretty good! Yours looks great with three different fruits! 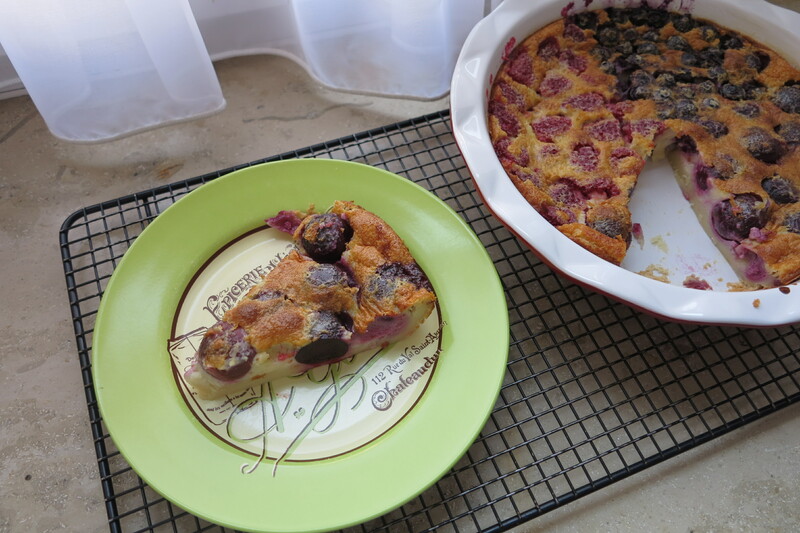 Rose, what a nice and delicious array of fresh summer fruit and berries – love the fact that you added three different kinds to your Clafoutis – I agree with you, this was a wonderful recipe and the sweet cherries that we get in stores these days are just too wonderful to pass up! Nice experiment! I agree with you on the cherries – I don’t see any difference from eating them out of a bowl. A pretty dish and some discreet spoon work, and it’s all fine. My custard took longer to set, too, but came out perfectly in the end. I love that you separated out the three berries! Berry Medley! A Clafoutis for all. This is a terrific recipe and versatile. Great idea to do the berries that way! Now you know which is your favorite! Fun idea to try a variety of fruits and berries! I would like to try this with blueberries one of these days. Yours looks great! Rose – that was a great idea to fruit-test the calfoutis. I really like the cherries and also think the next time I make this, I will add liqueur. Good idea. I couldn’t go with the pits – was serving this at a dinner party and yes, I didn’t want pits flying through the air or teeth getting chipped. You’re brave. Love how you tried three different fruits. We really liked it with the cherries but the blueberries sound excellent, too. Looks great. I didn’t mind the cherry pits, though I wasn’t sure until I tried. Good to know this works well with blueberries as they are just starting to come in locally.